The experienced English journalist William Whitridge, 'one of the most virile writers on the Register', according to later editor Sir William Sowden, established this newspaper in partnership with Andrew Garran during the South Australian Parliament's debating of the separation of church and state in the colony. This newspaper was in favour of complete separation, as was Whitridge's boss and member of parliament, Anthony Forster, then editor of the Register. The Austral Examiner represented the Non-Conformist churches views on the issue, while the Adelaide Morning Chronicle, under Andrew Murray, represented the Anglican viewpoint. The Austral Examiner includes in its pages details about the building of new churches in the colony, and other religious activities, as well as general news. The Examiner eventually amalgamated with George Dehane's Odd Fellows' Magazine, with Dehane and Whitridge sharing the editorship. 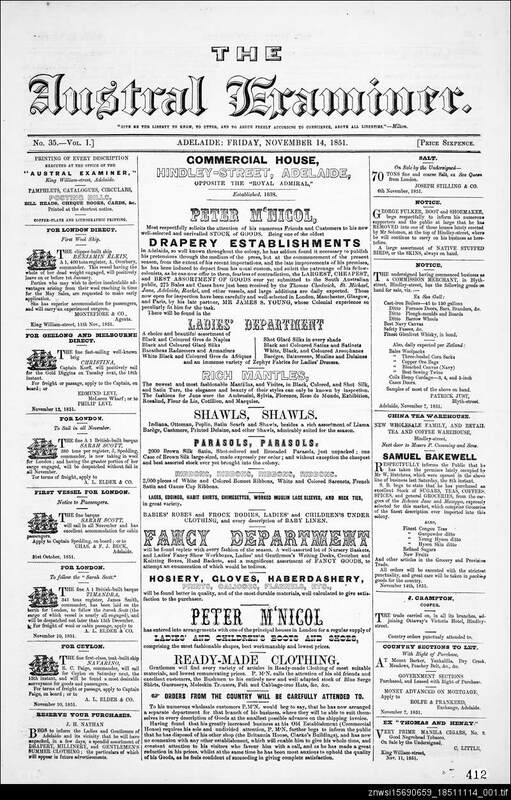 However the economic crisis precipitated in South Australia by the effects of the Victorian gold rush forced the newspaper to close. Whitridge died at the age of 36 of tuberculosis. Later two of his sons became well-known journalists at the Register.